14 years ago Arash began his career in the construction industry. He started doing basic construction labour at Liberty Development and learned the construction industry from the ground up. He gained hands-on experience by working with different trades, quickly learning what they did and how. Within two years, Arash was promoted to the role of Construction Manager. In this role, he supervised the staff at multiple construction sites and managed large scale construction projects to committed timelines and budgets. At Liberty, he worked on a variety of large scale residential projects including 25 Times Ave, a 10 storey mid-rise apartment building, Bristol Court, a townhouse complex, and other high rise condominium complexes in the GTA. With this experience, he branched off on his own and started a renovation business in Toronto. He grew his business renovating homes and doing leasehold improvements for commercial establishments. Custom building homes was a natural progression, and he built his first homes in North York and Willowdale. The custom homes he’s built range in size from 3,000 square feet to 6,800 square feet. You’ll find his custom built homes all over the GTA. Arash has grown his business strictly through word of mouth and client referrals and has a roster of repeat clients. He prides himself on delivering quality work, and is a knowledgeable source on renovation and custom building. Over his career, he’s had the opportunity to work on some unique and innovative projects for a range of clients. 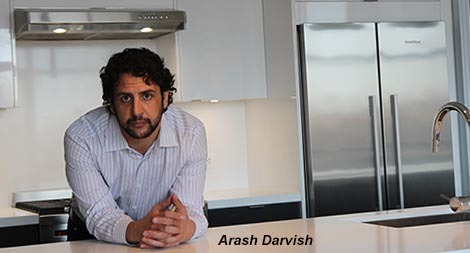 In his off time, Arash is a passionate mountain climber, and boasts two of the seven summits. In 2014 he summited Mount Kilimanjaro, the highest peak in Africa. In 2015 he climbed Aconcagua, the highest peak in South America. He aspires to summit an 8,000 metre peak, and has Annapurna, K2, Nanga Parbat, and yes, Everest, in his sights.